Apparently people don’t know how to fill in a scratch on furniture, so I’ll fill in the scratch, polish it up and relist it at a later date for sell. Or maybe I’ll just refinish the top, its actually quite a simple process and if you’re buying used furniture you might want to learn how to do it. 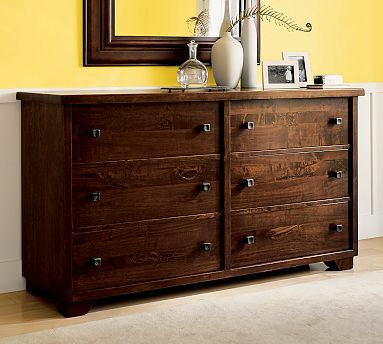 Pottery Barn Sumatra Extra-Wide Dresser, deep mahogany stain, rustically beautiful knots, burls and whorls, detailed with blackened-brass pulls on dovetailed drawers. Buyer must pick up from location (its a heavy piece). And I am not your “bro” or ‘buddy”, I happened to be a girl. If you tell me my website doesn’t look good on Chrome, use a different browser, personally I don’t like chrome and haven’t tested it on Chrome, I do know that it looks good on all other major browsers. And if you link back to your own blog, I check if its looks legit, I go to your blog and find it either doesn’t exist or you don’t exist, you’re spam. And if you want to link to me or do a repriocal link exchange, email me. If pages and post look like they’re disappearing, they’re not, just being moved. I think that’s the easiest way for me to consolidate, move slowly, delete as I go, clean house. I recently ordered and received my first batch of farm fresh veggies and fruits from Farm Fresh to You and its been an interesting couple of days biting into new wonderous things, what I thought was a potato is actually a lemon cucumber and I’ve never seen one of those before but its delicious it does take a little like a lemony cucumber. I had to go check out a site about cucumbers to figure out what I had, check it out here. I ordered the more mixed because I wanted a variety of items to start and to see how much I needed for a month’s supply of food. I’m trying out this concept of eating fresh and healthier. Although it has occured to me that I really don’t know how to cook certain things or what to do with them and I haven’t really ever used fresh herbs except occasionally, for example, what does one do with basil? I’m going to attempt basil ice cream, strangely enough that sounds delicious. So each month will be a discovery of new and exciting farm fresh veggies and fruits. When’s the last time you moved? Did you do it yourself or haggle friends to help you out on the big day? And the boxes, where did you get them? Behind grocery stores if you were lucky, from work, from friends who had extras or office supply stores? The last time I moved, I did all of the above. I rented the truck, got two friends to help, thank god, they brought their kids to help out, searched high and low for moving boxes which took days out of my time along with the days of prep time to pack the boxes before my friends arrived. Not to mention I had to wrangle all the cats into their carriers on the big moving day, get them moved first in one load, back to the first location to meet my friends to pack up the uhaul, my car, their cars because I didn’t get a big enough uhaul..whew, it was a long day but I made it into my first house with friends intact. In retrospect, it would have been so much easier to use upack, order the moving boxes and supplies that I needed before hand, upack has this handy estimator to estimate how many boxes you might need, what you think you might need in my experience, double it or buy an assortment of upack moving boxes kits. Upack is unique in that its a moving company that you pack up the truck and you unload the truck but they do all the driving between destinations. Yes, you have to plan for the move and order the truck but you have to do that anyways when getting a rental truck, arranging friends and family on your big day. You can also rent relocubes, portable storage containers that you lock up if you think its possible that your move might take a few days to get it together or the unpacking might take longer than a day. And the moving boxes and supplies, they will deliver them right to your front door in all kinds of assortments from kits for the kitchen, kits for the wardrobe, for a 1-2 bedroom apartment to 3+ bedroom home and included with their kits are all the supplies you need such as tape, dish protectors, divider pads, divider partitions, bubble wrap, things you would have to buy separately. If I ever move again, I’m calling Upack, you should too. Much to my surprise, not only is the other chiropractor gone but the whole office staff is gone replaced by a whole new staff. The new people that have no idea who the patients are or what the hell is going on with outlandish cover stories to what happened to the previous staff. You come to trust people and get to know them and then its like they never existed and you have to start over with a new group of people. Now its not the replacement people’s fault that the staff is gone but when you tell me you don’t ever plan to leave in a happy sing-song voice, trust me on this, I don’t believe you for a second, at some point your boss will get annoyed with you and you’ll never have existed and I’ll have to start over with a new staff that claims that will never leave in a happy sing-song voice. Why do I say outlandish cover stories because I was told that the office assistant just graduated from vet school and took a new job. Well, since I know for a fact that she did not just graduate from vet school because she was at my graduate ceremony getting her degree in business administration, what the hell? Come to find out she did get another job at a vet office, in the field she wants to practice and gave her two weeks notice but the doc told her to just leave. Now I understand staff comes and goes but its the manner in which staff comes and goes that defines a practice. If each year, your staff is replaced with a new staff – then something is odd. If your staff is replaced monthly, something is wrong. Is it you perhaps? Your most valuable asset is your staff, happy employees don’t leave happy places to work. Employees don’t leave bad companies – they leave bad bosses and if your patients keep seeing different people come and go, even if its over the course of a couple of years, they will leave too because the vibe in the office seems different. Its no longer a happy stress-free place, its got internal turmoil usually at the helm. If you are a bad boss, not only do you employees feel stressed, your patients or clients can feel it too. Although I now understand where my weird vibe was coming from every single time I go into that office, it doesn’t work for me, it hasn’t really worked for since they moved to a bizarre location that’s a traffic nightmare, its time to move on.